FREE Street Fit Course Up for Grabs, Worth £285! This week one lucky facebook fan will get a chance to win an exclusive Street Fit® Instructor Course Voucher WORTH £285!!! PLUS: Choreography on DVD, Royalty Free CD, Instructor Manual plus 1 year exclusive licence to teach Street Fit® classes. You can even give the voucher out as a present to a friend, who might want to attend the course!! 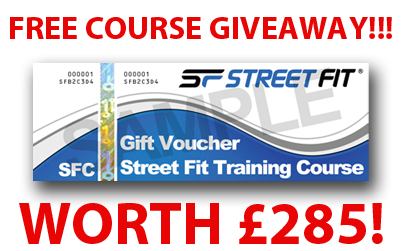 For your chance to win simply visit our facebook page to find the offer, https://www.facebook.com/streetfit.official then you MUST do ALL 3 of the following. We will pick a random winner on Friday 3rd Aug @ 5pm! http://www.streetfit.tv/wp-content/uploads/2012/11/free.jpg 235 700 admin http://www.streetfit.tv/wp-content/uploads/2014/07/StreetFit.png admin2012-08-02 10:28:242014-08-15 09:24:08FREE Street Fit Course Up for Grabs, Worth £285! “Be the change you wish to see in this world”. It’s a famous quote by Mahatma Gandhi, but how can it apply to UK fitness lovers in the 21st Century? Many of us are now getting caught up in the Olympics buzz and getting behind Team GB (or whatever country we hail from). But such a keen focus on athleticism can also highlight the general need to promote fitness to those who might struggle to motivate themselves out of a sedentary existence. Of course, most of us know that eating a balanced diet and exercising regularly will help stave off nasty diseases like Type 2 diabetes, heart disease and liver disease, but some of us need an external push to make those changes. Gandhi attracted a huge international following, but you could just start small – with your own community. Find a place to meet up (perhaps a church or a community centre) and invite people you know to join you in a run, bike ride or other fitness pursuit. By choosing a regular time and place you will be helping to create a routine which others can follow. As people get to know one another, your group will become a source of motivation and support. Facts tell but stories sell! If you want to encourage others to follow in your shoes, let them know what fitness has done for you. Whether you’ve trimmed five inches off your waist, dropped two dress sizes or developed a six-pack, remind them that every journey starts with a single step. Share the heartache as well as the joy, helping to create a connection that lasts through periods of struggle. The more colourful your story, the more likely people will be to remember it. If you look around, you will see that there are many companies offering diplomas and certificates, including NVQs and NVQ Diplomas. Ideally, you should find a course that is REPS accredited, so that you can prove to prospective employers that your skills meet the National Occupational Standards. Just like our Olympic athletes, you know that keeping active gives you a wealth of benefits from increased energy and self-esteem to a trimmer, slimmer physique. Now its time to spread the message and get Britain moving! http://www.streetfit.tv/wp-content/uploads/2012/08/promote1.jpg 246 700 admin http://www.streetfit.tv/wp-content/uploads/2014/07/StreetFit.png admin2012-08-01 08:56:312014-08-15 14:29:29What Can YOU Do to Promote Fitness?